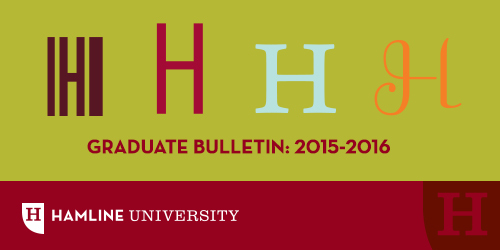 The 2015–2016 Hamline University Graduate Bulletin is the primary resource for academic information, including official curricular requirements, for Hamline University graduate students. Students who are admitted for, and enrolled during, the 2015–2016 academic year are subject to the degree requirements described in this Bulletin. Students are encouraged to familiarize themselves with the policies and procedures of Hamline University early in their academic career. Failure to read this Bulletin does not excuse students from the requirements and provisions described herein. Every effort has been made to ensure the accuracy of the information in the Bulletin. NOTE: The academic standards and policies, courses, and curricula described in this Bulletin, and the teaching personnel listed, are subject to change or cancellation by official action of Hamline University. Updates are made annually and every effort has been made to ensure the accuracy of the information in the Bulletin; however, when the printed and online versions of the Bulletin differ, the official version is the online edition. Neither the provisions of this 2015-2016 Hamline University Graduate Bulletin nor the acceptance of students to the University through the admission, enrollment, and registration processes constitutes a contract or an offer of a contract. The university further reserves the right to require a student to withdraw from the University for cause at any time.